An economical option for light storage. Available in all pan sizes except half size long pans. An economical option for light storage of your food pans. Designed to fit Camwear polycarbonate Food Pans, the new translucent seal lids feature an inner seal that provides superior spill resistance and maximizes product freshness. This model replaces model 10SC. 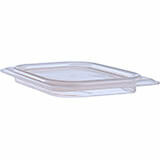 Polycarbonate lids only fit Cambro clear polycarbonate pans, lids are not interchangeable with other materials. An economical option for light storage of your food pans. Designed to fit Camwear polycarbonate Food Pans, the new translucent seal lids feature an inner seal that provides superior spill resistance and maximizes product freshness. This model replaces model 20SC. Polycarbonate lids only fit Cambro clear polycarbonate pans, lids are not interchangeable with other materials. An economical option for light storage of your food pans. Designed to fit Camwear polycarbonate Food Pans, the new translucent seal lids feature an inner seal that provides superior spill resistance and maximizes product freshness. This model replaces model 30SC. Polycarbonate lids only fit Cambro clear polycarbonate pans, lids are not interchangeable with other materials. An economical option for light storage of your food pans. Designed to fit Camwear polycarbonate Food Pans, the new translucent seal lids feature an inner seal that provides superior spill resistance and maximizes product freshness. This model replaces model 40SC. Polycarbonate lids only fit Cambro clear polycarbonate pans, lids are not interchangeable with other materials. An economical option for light storage of your food pans. Designed to fit Camwear polycarbonate Food Pans, the new translucent seal lids feature an inner seal that provides superior spill resistance and maximizes product freshness. This model replaces model 60SC. Polycarbonate lids only fit Cambro clear polycarbonate pans, lids are not interchangeable with other materials. An economical option for light storage of your food pans. Designed to fit Camwear polycarbonate Food Pans, the new translucent seal lids feature an inner seal that provides superior spill resistance and maximizes product freshness. This model replaces model 90SC. 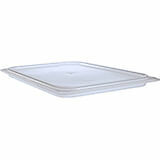 Polycarbonate lids only fit Cambro clear polycarbonate pans, lids are not interchangeable with other materials.